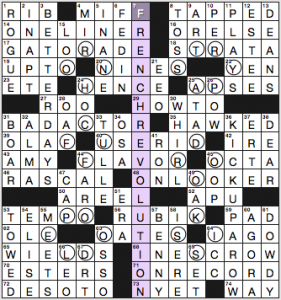 I solved this puzzle without paying the slightest attention to the circled letters and without reading the whole clue for the FRENCH REVOLUTION revealer, 7d. [Historical event suggested by each of the six groups of circled letters]. “Historical event, starts with FREN—, must be FRENCH REVOLUTION.” So I basically solved the puzzle as if it were a dreadful themeless packed with iffy fill, and it wasn’t fun. After the fact, I see that the loops (they “revolve,” as in REVOLUTION) spell out a bunch of things that follow French in familiar phrases: HORN PASTRY CUFF DOOR POODLE KISS. It’s awkward that the starting points of these circular words varies. “TRYPAS?? RNHO? 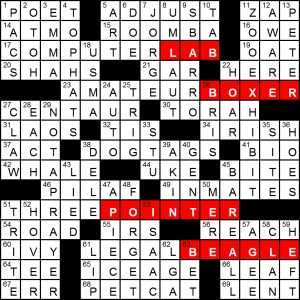 ?” It’s a nice concept, but the overall puzzle needed to be a lot smoother to make it worthwhile. Fill I wasn’t keen on includes APSES, OCTA-, AREEL, ESTERS, FARO, DR. T, FED IN, OSA, EEO, ISERE, ICC, ERTE, AGORA. Those entries all feel DOWDY (though DOWDY is a lively word). And BETTER DAYS feels stranded with its “seen” consigned to the clue. BETTER DAYS doesn’t strike me as an idiomatic stand-alone term. 36d. [Start some trouble], KICK UP A ROW. Is this largely a Britishism, or perhaps a quaint term that doesn’t get as much use these days? I wanted one more square for KICK UP A FUSS. Prepositional/short-word dupes—do they bug you? We have FED IN and IN ESCROW, KICK UP A ROW and UP TO and HOW TO, ONLOOKER and ON RECORD. Show me the money! 8d. [Coin ___] TOSS and 32d. [President Coin in the “Hunger Games” series], ALMA. 2.5 stars from me. 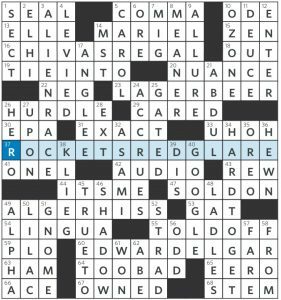 I was hoping to have more fun in this Wednesday crossword than I did. I also don’t have any French PASTRY in the house, and this wasn’t a problem till the puzzle made me aware of it. The title is thematic in that it contains an anagram with the letters L, A, R, G, and E, just like the rest of the theme answers. 23a [Stella Artois, e.g.] LAGER BEER. This feels redundant and not in the language. If it’s lager, you know it’s beer. 37a [It helped to prove “our flag was still there”] ROCKETS’ RED GLARE. BOMBS BURSTING IN AIR didn’t fit. Nice grid-spanner, though. 49a [Suspected Soviet spy of the McCarthy era] ALGER HISS. I know the name, but not the details of the case. 60a [“Enigma Variations” composer] EDWARD ELGAR. When I think of Elgar, I think of “Pomp and Circumstance” and…Donald Duck. A couple things here. First, an anagram theme often has a revealer, like “MIXED such-and-such” or something similar. I don’t think it’s absolutely necessary here, but the absence of one might throw some people, and the title, “Large Order,” doesn’t indicate anagrams. Second, the anagrammed letters are usually in the same place in each themer, either at the beginning, the end, or spanning the middle. There isn’t consistency here, but I do like the fact that they alternate, so that there is a recognizable pattern. Aside from the redundant LAGER BEER, this is a nice set. As for the fill, I like ALIEN RACE [Klingons or Romulans] and TOLD OFF [Called on the carpet], but I’m torn on HARD TO GET [What some singles might play]. On the one hand, it’s an established phrase, but on the other hand, it feels sexist despite its genderless clue. It perpetuates this idea that even if a woman says “No,” what she really means, is “Yes, but you’ll have to earn it.” The truth of the matter is that “No” means “No” and that’s the end of it. I was also distracted by the reliance on crosswordese such as ONEL [Scott Turow memoir], EERO [Architect Saarinen], ELHI [Precollege, for short], and AS AM I [“Same here”]. These entries have no currency and shouldn’t be used as fill unless absolutely necessary. I don’t see such necessity in this grid. Out of left field comes the entry KLIEG [Filmmaking light]. I don’t mind learning something new, but this is crossing the L in ONEL, the E in ALGER, and the G in LINGUA. Most of us won’t have a problem with these crossings, but I’m sure some did. As for the lights, apparently they’re so bright that they allow filmmakers to shoot daytime scenes at night, but they can lead to “KLIEG eye“. All in all, a fine theme, but some detracting points get it marked down. 3.1 stars from me. I’ve seen a few too many “breeds of dogs” themes to be excited by this one… Your mileage may very. DOGTAGS was a clever revealer, at least. Bits: [High-tech classroom], COMPUTERLAB is accurate circa 1990 perhaps. [Madagascar!, in the Bronx], ZOOEXHIBIT is punctuated peculiarly. [Made up things], LIED – an interesting clue; parsed differently, it also fit LIEs! I had not seen the promotional clip for ABBA’s WATERLOO (71A: “1974 Eurovision Song Contest winner for ABBA”) before. It is certainly a thing. Since it’s late and I’m late, let’s wrap up with some fill that brought me GLADNESS: INIGO Montoya, RARE EARTH elements, SARAN wrap, THAT’S THAT, the mere memory that we titled a Bond film Quantum of SOLACE, EUCLID, and LIFE HACK, which is a fancy modern term for the sort of thing that used to appear under Hints from Heloise. This entry was posted in Daily Puzzles and tagged Aimee Lucido, Alan Arbesfeld, David J. Kahn, Gary Cee, Patrick Berry. Bookmark the permalink. For the WSJ, I think “order” in the title is meant to signal anagrams (putting the letters in order). I see what you’re saying. But it would make more sense to me as “Large Disorder” (though that makes a terrible title). Although I enjoyed the WSJ well enough, I am compelled to weigh in on the clue for the first themer: Chivas Regal is by no means a premium scotch, although it is a fine, smooth, tasty, easy-drinking blend. Oh, I’m just so “good” at parsing themes that I totally missed large, and thought each theme had gal (as in the abbr. for the large amount called a gallon) in different orders. Go ahead – I deserve being laughed at for that one! 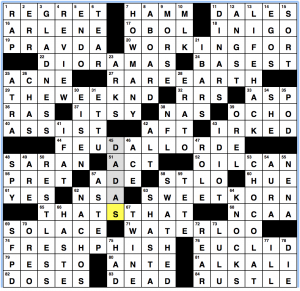 I did enjoy doing the WSJ puzzle, though. 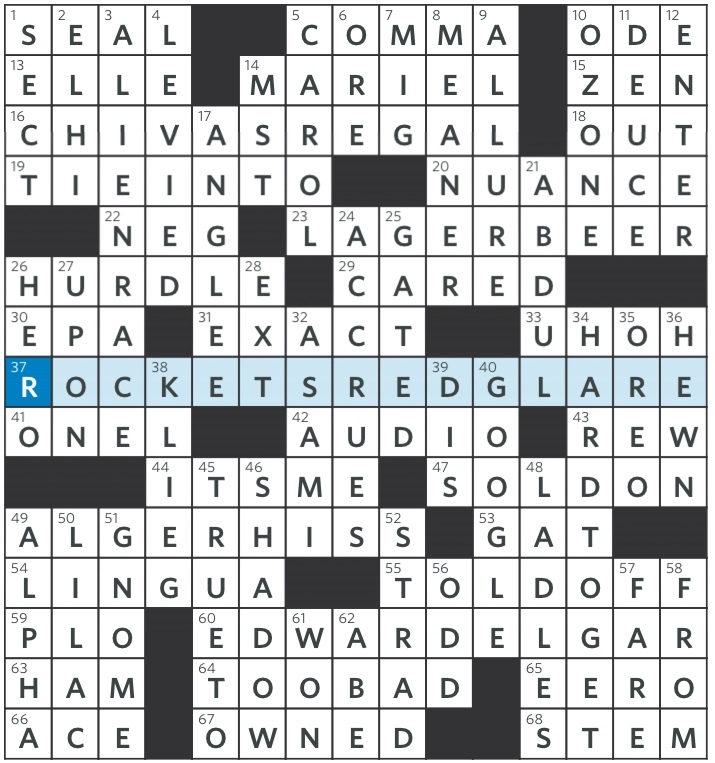 NYT: So delighted to see my name in the puzzle (54-down), I forgave the unfriendly fill, and rated this 5. I liked the theme despite the lopsided “revolutions” and spending much longer than usual to solve. AVCX: Weighing in a bit late here, but I hands down loved this. I worried at first that I wouldn’t be able to complete it, as more than a few references were unfamiliar, but the crossings were friendly and I discovered, to my delight, that I know more about music than I had thought. I love Aimee Lucido’s clueing style, also. Nice one!